This family-friendly Anaheim resort is located in the suburbs, within a 10-minute walk of Disneyland® Park and Downtown Disney® District. Disney California Adventure® Park and Disneyland® are also within 1 mile (2 km). This smoke-free resort features 4 restaurants, 3 outdoor pools and a fitness centre. WiFi in public areas is free. Additionally, a bar/lounge, a poolside bar and a spa tub are on-site. All 973 individually decorated rooms feature free WiFi and room service. Other amenities available to guests include flat-screen TVs, free weekday newspapers and hairdryers. 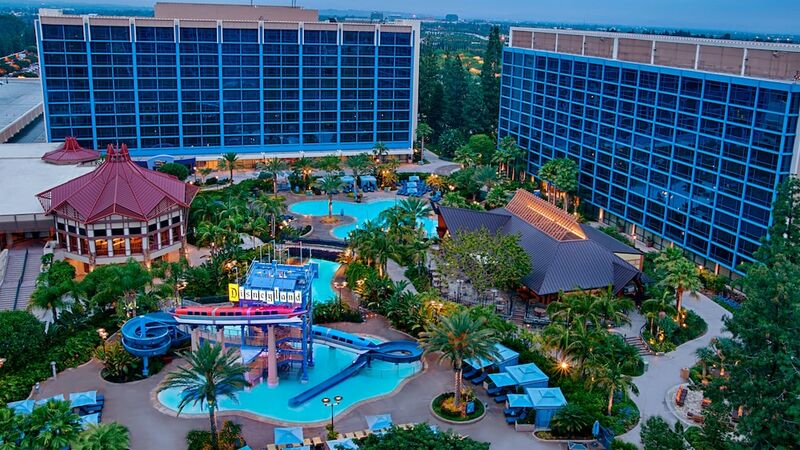 Disneyland Hotel features 3 the outdoor swimming pools, a waterslide, a spa tub and a fitness centre. Dining is available at one of the resort's 4 restaurants. Guests can unwind with a drink at one of the resort's bars, which include A poolside bar and A bar/lounge. Public areas are equipped with complimentary wireless Internet access. This 4-star property offers access to a business centre. Event facilities measuring 136000 square feet (12635 square metres) include conference rooms. This family-friendly resort also offers a terrace, tour or ticket assistance and an arcade/games room. Parking is available on-site at a surcharge. Disneyland Hotel is a smoke-free property. Tangaroa Terrace – This restaurant specialises in American cuisine and serves breakfast, lunch and dinner. Trader Sams Tiki Bar – This cocktail bar only serves dinner. Steakhouse 55 – This steakhouse serves breakfast and dinner. Goofys Kitchen – This buffet restaurant specialises in American cuisine and serves breakfast and dinner. The Coffee House – This coffee shop only serves breakfast. 3 the outdoor swimming pools are on site along with a spa tub. Other recreational amenities include a waterslide and a fitness centre.